My job requires a lot of hours at the keyboard, so I decide to swap my desk for something a bit more comfortable. 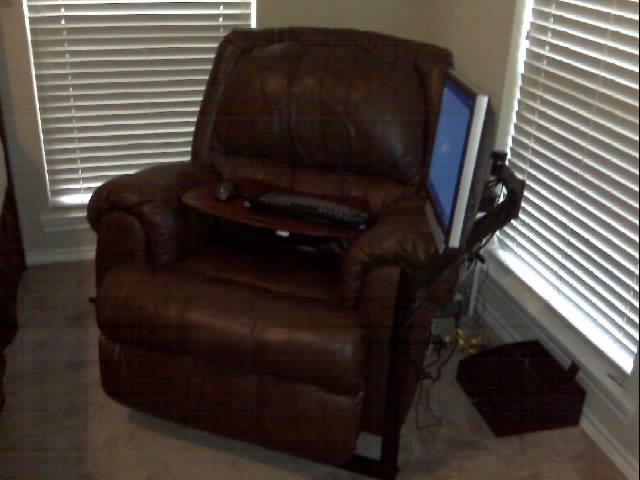 After a little searching I opted for a recliner and a LCD stand. To round out the setup, I tossed in a wireless keyboard, wireless mouse, and a nice lap board. My only complaints so far are that the stand is held in place by the weight of the recliner and I hate the keyboard. However, I have yet to knock it over and have pre ordered the new Logitech K340 compact keyboard. Sir, I see no control panel for Bookworm. In my world Bookworm has it’s own pedestal, as for said score, seeing is believing. Thats my work rig, I have bookworm installed on my notebook. I guess I better get that score posted asap!